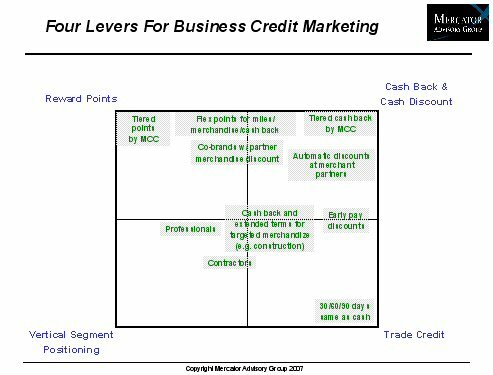 This individual Report Small Business Credit Card 2007 Update: Competition For Segments Intensifies is available for purchase. This Report is available to members of Mercator Advisory Group’s Credit Advisory Service. Please be advised that this Report is normally part of a research and advisory service that provides ongoing support throughout the year. As such, this Report contains significant depth of content that is selected for its strategic importance to our members. (For a description of these services, see our Advisory Services section). The potential combination among these four dimensions are nearly unlimited. Credit card issuers and other lenders may use them to offer segmented offerings to capture the attention of small businesses and engage them in using the product. The small business credit card market continues to offer above average growth opportunities to issuers. The complex segment structure of the small business universe is spawning segment-oriented products, with more such offerings to come. The value of trade credit to cash-flow-affected small businesses is significant, and lenders are increasingly offering trade terms in their programs. Future marketing directions are likely to pursue narrower segment interests, as well as offering user-selected trade terms. Ken Paterson, Director of the Credit Advisory Service at Mercator Advisory Group and the author of this report comments that, "there are some key product developments in the industry that may well cause small businesses and lenders to re-discover credit terms, and in particular business-oriented trade credit that is not just a re-packaged consumer offering. Trade credit terms in various incarnations are becoming available through small business programs, and may well make an impact on future product directions."